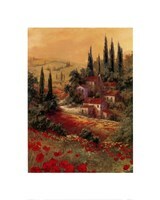 “Tuscan Summer” by Ben Harris is a decorative landscape piece, full of bright colors and a colorful Tuscan landscape. In this image, a traditional Tuscan-styled home is featured on the right, with a forest of tall, green trees behind it, and red trees growing in the front. 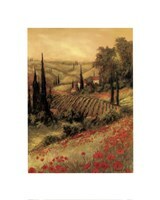 There are fields with more Tuscan homes that can be seen in the distance, and front and center, spanning the width of the entire image are bright red poppies - really making the image pop. Painted with oils in a contemporary, yet impressionistic style, this image would bring color to any room with a Tuscan feel or warm color scheme. 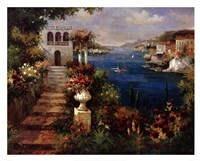 The classic scene would also help it to work in a more traditional Italian home, making it a very versatile piece that is great for gift giving and home décor. A brown frame is a great choice for a more subtle look, and a cherry colored frame would help to make this piece stand out on your walls even more.